Steal My System Review - What a Scam! Did you come across a money making opportunity called Steal My System? If you did, keep your credit card away – because Steal My System is a scam! We have done the needful investigations, so make sure to read our full Steal My System review before you fall into an obvious scam! 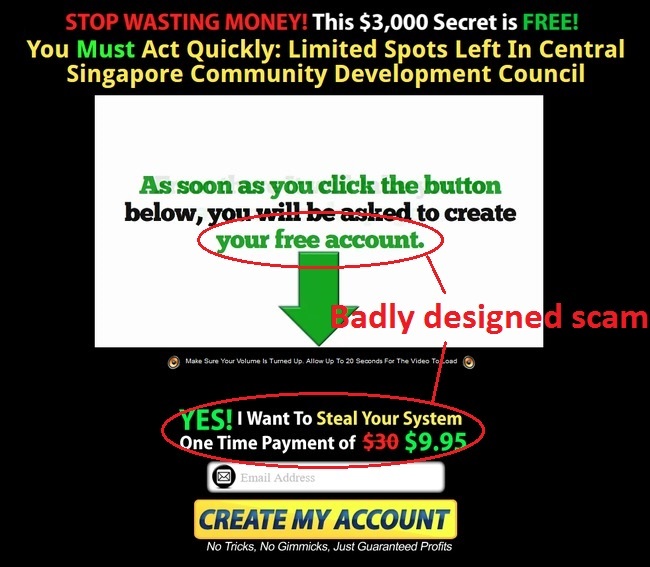 As soon as you arrive at the home page of Steal My System scam, you will be greeted by an eye-catching headline and an auto-play video. There’s nothing else in the sales page, because it’s the scammers’ intention to keep you focused on the video. At the beginning of the video, I was to promised a secret to making $3,000 for free by the end of the video. However, after watching the entire sales video, I still don’t have a clue of what that secret is. All I know is that I have to pay to access some kind of “secret system” that will generate me money, without knowing how it works at all. Is this the way a legitimate opportunity works? Of course not. This is the a typical scam tactic used to generate hype, and delivers nothing at all. The testimonial in Steal My System scam is fake. If you watched the entire sales video, you would’ve came across some member testimonials who claim to have made huge money with the system. These testimonials were included in the video to boost the credibility of the system, but we have found evidence to prove that Steal My System is a scam. The testimonials were produced by hired actors to confuse the scam victims. Compare the man shown in the screenshot above against the “member” of Steal My System scam. They are the same person, and he is actually a Fiverr actor. You can verify the authenticity of our claim by visiting his Fiverr profile: fiverr.com/jordan831. Check out the gig description of this seller. 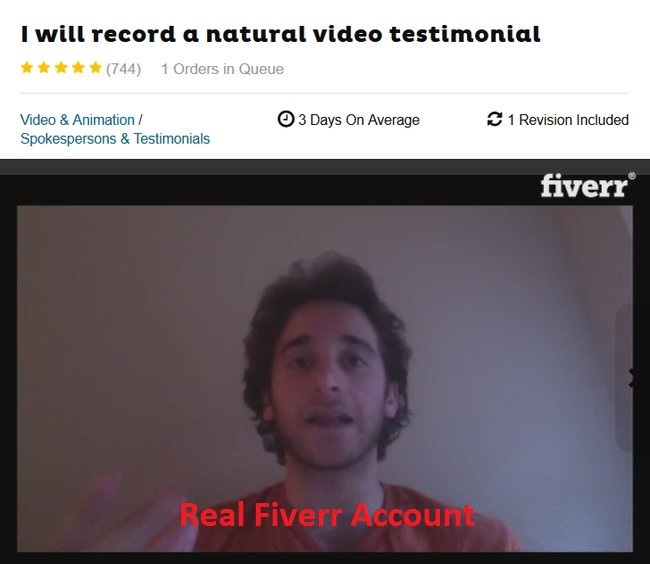 He promises to create a video testimonial that looks 100% natural for only $5. As if hiring one actor isn’t enough, Steal My System scam employed yet another Fiverr actress to promote the scam. Her Fiverr profile has since been taken down, but we have seen her being featured in other online scams. Apart from Steal My System, she was also featured in The Aussie Method and Millionaires Maker scams, which we have reviewed earlier. You can check the links above if you need to verify it for yourself. If Steal My System scam is as good as they claim, why do they need to hire actors to fake the testimonials? There’s only one reason – it’s because the scammers are out to get your money, but the system does not work at all! When you are approaching the end of the sales video, you will be invited to create your “free account”. However, it is clearly stated in the sign up form that you need to pay a $9.95 fees to get started. Apparently, this was a scam put together in a very short period of time, and the sales video’s only purpose is to get people excited to sign up. Naturally, what you see in the sales video are geared towards generating hypes, where they use words like “FREE” and “GUARANTEED PROFITS” repeatedly. 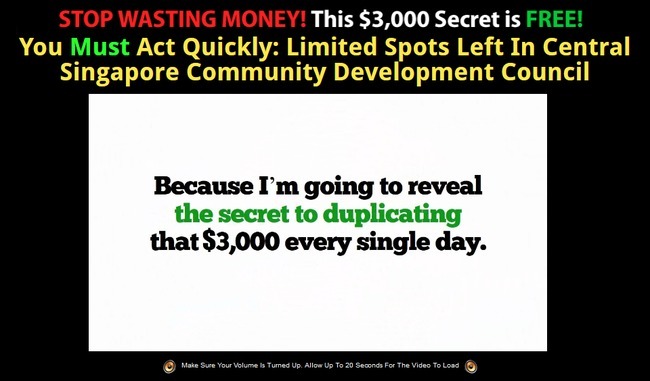 The $3,000 secret promised at the beginning of the sales video is another example of this shady marketing tactic. They don’t necessarily tally with the rest of the sales page, because victims who are convinced to sign up would pretend not to notice the obvious red flags, anyway. Where Does Steal My System Lead to? Steal My System redirects you to another scam. After providing my email address, I was redirected to purchase another scam called Explosive Payday. This has nothing to do with Steal My System, and it is a standalone online scam. Notice how the original price changes from $30 to $399. We have also received reports from readers where Steal My System scam redirects them to Vibrant Money System and 12 Minutes Payday. Also, look closely at the terms quoted by Explosive Payday above. You will be charged $29.95 after the 5 days trial, and will be charged $29.95 for every 30 days thereafter. A lot of people thought $9.95 is all it takes, and regretted buying into the scam. There’s no support to call, so it’s very difficult to get a refund or stop the recurring payment. If you are redirected to any other scams, similar payment structures will apply. YES, STEAL MY SYSTEM IS A SCAM. It acts as a landing page for multiple other scams, and its sole purpose is to sign you up for a scam that incurs recurring payments. If this is still legitimate…then where is my receipt of payment? Hi Helen, as stated in the post, Steal My System is a scam. You shouldn’t sign up for it at all. 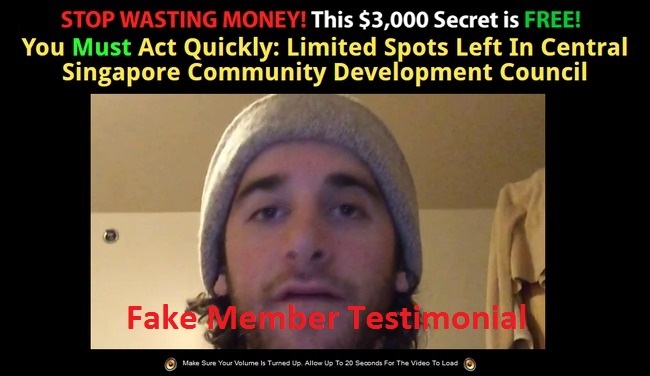 MOBE is another scam that I don’t recommend, but Wealthy Affiliate is a legitimate training program for people who want to set up websites for affiliate income.